Rogers Street,today, is one of Lowell‘s main gateways into the city, providing access from Tewksbury, the city’s southern neighbor. Known by many outside Lowell simply as Route 38, the road has a long past that is deeply connected to Lowell’s history, and to the history of its Belvidere neighborhood especially. Rogers Street gets its name from the Rogers family, who were early landowners in the area during Lowell’s first years. Members of the Rogers family later went on to found the Rogers Hall School for Girls, a prestigious school that remained in operation for over 80 years before it closed in 1973. Though its white-columned facade is its most familiar characteristic to Lowell residents, the school actually consisted of four buildings: Rogers Hall, Rogers House, Rogers Cottage, and the Gymnasium. The gymnasium was famous in its own right for its pool. Built in 1922 in the basement of the gym, it was the first of its kind for a private girls’ secondary school in the country. The private girls’ high school accepted both day and boarding students, with the day students sharing in all of the privileges of boarders. Boarders lived in the “Hall”, the original school building, or “the house”, a nearby Victorian mansion. Girls participated in activities like hockey, basketball, swimming, glee club, and drama. And they attended dances and proms at other schools and then invited the male students of other schools back to similar events at Rogers Hall. An account linked below recalls a 1950 prom, told from the perspective of a visiting male student . . . who tells a rather truthful account that reminds us that alcohol use among prom-goers didn’t really emerge with ‘today’s kids’. As the 1970s progressed, it became clear that Rogers Hall was fading from the scene. Even though the administration was tight-lipped about the conditions leading to the school’s imminent closure, it was obvious that its financial health had suffered for several years before its closure was announced. Enrollment had fallen to 47 girls by 1973, less than half of its 100+ peak enrollment reached just 18 years before. At the time of the 1860 US Census, the Rogers Family had lost its patriarch, Zadock Rogers, Sr. Emily and Elizabeth were among the youngest siblings. The history of the school’s majestic buildings stretched back beyond the school’s 1892 founding. Its main building, the Zadock Rogers House, dated to the 1830s when it began as part of a vast farm of almost 250 acres. By 1880, Zadock Rogers and all but two of his children had died, leaving his considerable holdings to his two surviving daughters, Emily and Elizabeth Rogers. Emily, who had attended the famous Miss Grant’s Girls’ School in Ipswich for two years during her youth, conceived of the idea to convert the Rogers home into a school after both sisters had died. She died of pneumonia in 1884. Carrying on the plans she had discussed with her sister, Elizabeth lived to realize their plan. In 1892, just a few years before she died, Elizabeth donated her own home to the future school. The sisters’ original plan had called for the donation of their estate to charity after both had died, but Elizabeth had a change of heart after meeting Mrs. Underhill, who had opened a girls’ school in Belvidere in 1891. That school, lacking appropriate facilities to board students, was failing when Elizabeth began to look into founding Rogers Hall, while she was still alive. She approached Mrs. Underhill, asking her to run the new school if Rogers were to provide the appropriate grounds. Mrs. Underhill agreed, and remained the school’s first principal for its first 18 years. By the time of the 1880 US Census, Emily and Elizabeth Rogers were the sole remaining members of the Rogers family. They began to discuss the future of their estate once they were gone. The school was situated on about five acres of the original Rogers property. In her last years, Elizabeth donated another 30 acres of land across the street from their farmhouse to the City in 1886; this later became Rogers Fort Hill Park. The rest, over 200 acres, was sold for development and today forms the neighborhood surrounding the park and former school. Elizabeth died in 1898 of pneumonia, just five months shy of her 80th birthday. Rev. John M. Greene, pastor at the Eliot Church in Lowell, helped Elizabeth Rogers found the school. He had also helped found Smith College. In 1892, the school opened with 11 faculty and 50 students. All but nine were day students. 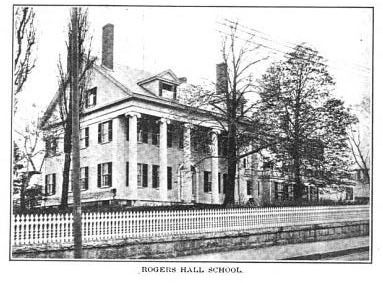 The Rogers sisters lived a strict, austere life governed by Christian ideals, which they incorporated into the education provided to the students attending Rogers Hall. Students lived by a rigid schedule, which left ample time for studying as well as rest. Lights had to be put out by 9:30 each night. Appearances were considered very important too. Nightly, before formal dinners, staff would check the seams of students’ stockings for straightness. Once dinner began, table manners were carefully monitored and evaluated. In its earlier years, Rogers Hall was known for enforcing a strict, orderly lifestyle. Prior to admission into formal dinner each night, girls were inspected to ensure that they exhibited proper posture as well as straight seams on their stockings. Rogers Hall produced many distinguished alumnae. Among them, Anne Harvey Sexton, a 1947 graduate, was later awarded the Pulitzer price for poetry. Dr. Mona Meehan went on to become the first female chief of staff appointed to a US hospital at St. John’s Hospital, now part of Saints Medical Center. And, Edith Nourse Rogers, no relation to the founding Rogers family, served the Massachusetts Fifth District as a congresswoman for 35 years after her husband died in office in 1925. At its peak enrollment in 1955, Rogers Hall had more than 100 students. In its waning years, the percentage of day students soared, from 10% in 1968 to 50% in 1970, and 75% by 1973, when it closed. Rising tuition prices and the advent of co-educational schools were both blamed for the school’s declining enrollment. Today, Rogers Hall still sits on Lowell’s Rogers Street and serves as elderly housing. That would make a great post. Rogers Hall has been a popular topic here. Is there any way you could send some scans of the pages my way? My mother Lynne Patrick Griggs attended Rogers Hall in the 1940s. 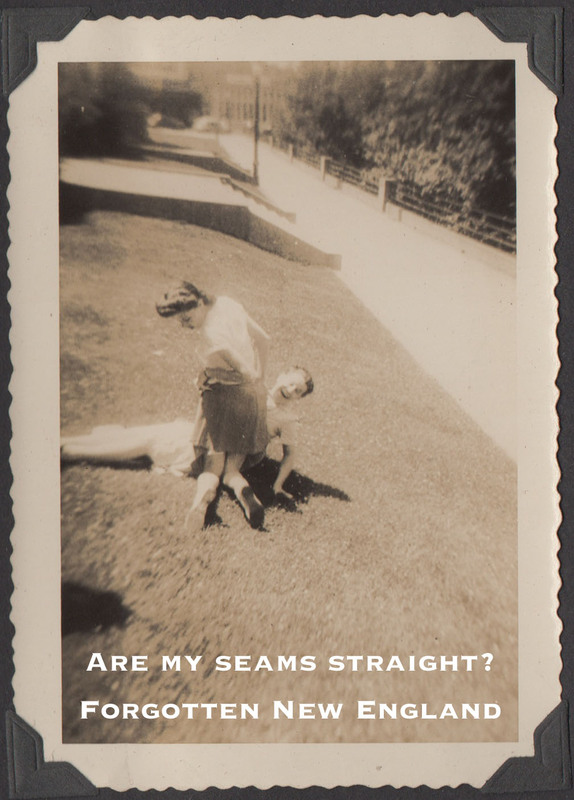 Does any alumnae remember her or her room mate artist Lynn Messner? My late mother, Kathleen Beever, taught English at Rogers Hall in the years 1949 and 1950, before I was born. The 1950 yearbook is dedicated to her. When I was a child (in England) she spoke very often, and fondly, of her days at the school. For some reason, the name of one of the students, Marilyn Cashman, sticks in my memory. The principal of the school at that time was one Mrs Katherine McGay (or possibly McGill). Peter, is your mother still living? Would she remember “Miss Beever”? I live in the building that was formerly the gymnasium for Rogers Hall. It was converted to condos in 2012 but still has a lot of history in it. It’s a fascinating building–unfortunately the pool is no longer a pool but the slope and blue paint are still visible in the basement. I discovered that both my mother Lynne Patrick (Griggs) and her half sister Jane Jefferson (Bell) had attended Rogers Hall in the 1940s and 1950s. My mother’s room mate was Lynn Hamby (Messner).